At this time of year, it becomes very important to wear sunscreen daily. Driving in the car, and any daily activities that take you in and out of the sun, put you at risk for excessive UV radiation exposure. It is now well established that exposure to UV radiation not only increases your risk of skin cancer but also promotes premature aging of the skin. However, with all of the many sunscreens available and the aggressive marketing of these products, choosing the right sunscreen is very confusing. A recent Globe and Mail article reported that the FDA in the United States is now beginning to regulate the sunscreen industry, as many sunscreen labels have been found to be inaccurate. Claims of broad-spectrum coverage for many products are not always valid, nor are claims of water resistance. 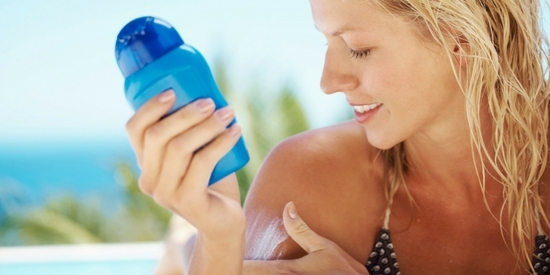 Some sunscreen products do not accurately list their ingredients. It is important to understand something about UV radiation when choosing a sunscreen. UVB radiation is responsible for sunburns and skin cancer. However, the vast majority of the sun’s rays take the form of UVA radiation, which is absorbed deeply into the skin and is responsible for premature aging. It also has now been shown to cause skin cancer. SPF, or the “sun protection factor” of a given sunscreen refers to its ability to block UVB radiation only. The PPD, or “persistent pigment darkening” index of a given sunscreen reflects its UVA blocking ability. All individuals should choose a sunscreen with both a high SPF and a high PPD. Ingredients within sunscreens include sun blocking agents, which reflect the sun’s rays, and which are also referred to as physical sunscreens, as well as chemical agents which absorb UV radiation through a chemical reaction. Physical blocking agents, the commonest being zinc oxide, and titanium dioxide, tend to be well tolerated and least irritating to the skin, and may, therefore, be desirable for people with reactive, rosacea or acne prone skin. These agents are typically very safe and are stable compounds which do not break down with light exposure. They can, therefore, give long-lasting protection. They do not, however, offer full spectrum protection for UVA rays. These agents are also thick, and sometimes unpleasant inconsistency. They tend to make the skin appear white and can feel greasy. Many sunscreens contain alcohol in an effort to reduce a greasy consistency. This, in turn, can cause stinging and in individuals with dry skin can be too drying. Chemical sunscreen ingredients can sometimes be unstable in sunlight, and therefore may not offer long lasting protection. Some, like avobenzone, can be associated with skin irritation or allergic reactions. They may also generate free radicals, which can promote skin aging, the very thing we want to avoid. However, certain chemical sunscreen agents do offer complete UVA protection, and they are also colorless and odorless and are often a thinner more pleasant consistency than physical barriers. Good quality sunscreen often contains a combination of both physical and chemical sunscreen ingredients carefully balanced to offer optimal protection while at the same time a pleasant consistency and minimal skin irritation. Ideally, these creams also contain other beneficial ingredients that promote skin health. The best way to choose a sunscreen is to try a sample on your hand to ensure you find the consistency and scent appealing. You should ensure the sunscreen is indeed broad spectrum and that it has an SPF of at least 30. In the summer months, we recommend as high an SPF as possible, particularly when you are in the sun for any extended period of time. You should also choose a sunscreen that is formulated in a way that is convenient for you. Many of our patients find that for application on the body, a spray sunscreen such as DermaGlo SPF 70 topical spray, is extremely convenient and quick. La Roche Posay a offers a stick application, which is ideal for carrying in a pocket or purse when traveling or participating in sports. Other excellent options include Obaji and SwissTec sunscreens, available in a range of SPFs, and for high-risk individuals who are fair skinned, or have a history of skin cancer or previous sun damage, Dermaglow SPF 85 offers superb protection and a light, easy to wear texture. Important aspects of appropriate sunscreen use include using an adequate amount of sunscreen and massaging it well into the skin at least 20 minutes prior to going outside, and frequent reapplication, at least every two hours. It’s important to use products with UV protection on all areas that are sun-exposed including the lips. Do not use old or out of date sunscreen. Avoid sun exposure during peak hours and wear protective clothing and a hat. For professional help choosing a sunscreen that is right for you, contact us at 905-273-3045, and make an appointment with our medical aesthetician who will be happy to help you.